What do a typical garden snail and an octopus have in common, besides the occasional appearance on the plates of adventurous diners? More than you may realize. Both are mollusks, a group of animals that includes everything from slugs to squids, and one that has for years confounded efforts to describe how its varied members evolved. 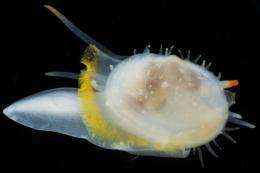 But now, with the help of the latest genetic tools, researchers at Harvard and collaborating institutions have completed the most comprehensive evolutionary tree ever produced for mollusks. Described in the Nov. 2 issue of Nature, the work also serves as a proof-of-concept, demonstrating the power of genomic techniques to answer difficult evolutionary questions. Using more than a dozen mollusk species collected from around the world, Giribet and other researchers went to work, sequencing nearly every gene in the animal before selecting 1,800 specific genes to compare across species. By comparing those sequences with each other, and with genetic information from other species, they were able to reconstruct the ways in which all mollusk species are related to one another. In a scientific first, the results suggest that bivalves, a class of animals that includes clams and oysters, are most closely related to gastropods such as snails and slugs. Other findings, Giribet said, resolve the divergence between mollusks that developed shells and those that did not. Perhaps the papers most interesting finding, however, is that monoplacophorans, a type of mollusk thought to be extinct until the early 1950s, are most closely related to cephalopods, a group that includes octopus and squid. Similar theories had been advanced by paleontologists based on the fossil record, Giribet said, but, until now, without the support of biological analysis. Understanding the phylogeny of an animal, Giribet said, is a critical first step in understanding how developmental mechanisms and anatomical changes evolve over millions of years. The first step is in knowing the relationship between animals, Giribet said. We need to have that phylogenetic framework, because otherwise were making the wrong comparisons. This story is published courtesy of the Harvard Gazette, Harvard Universitys official newspaper. For additional university news, visit Harvard.edu. Pikaia Gracilens from the middle Cambrian has a striking resemblance to the slug-mollusc (typical eyes on stalks), but it also resembles a small hagfish. Why not compare the mollusc and hagfish at the genetic level? And it would be nice to compare with both of those - tropical terrestrial turbellarians which have real eyes with lenses and ortogon-type brain. Turbellarians are very similar to the creatures of the Vendian!